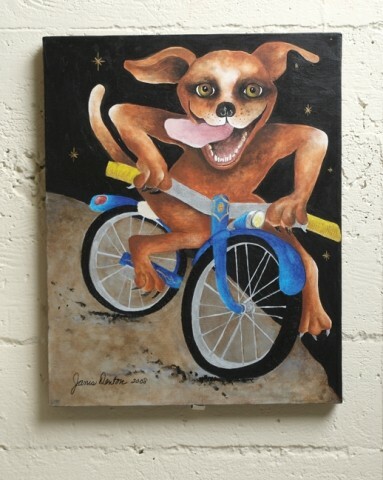 NEW TRICKS FOR DOGS : Janis Deton, whose work is pictured, is one of several artists showing at the bike art show. # unmistakably the work of SLO's Tall Bike Posse. The exhibit, opening at 1060 Osos St. in San Luis Obispo (formerly the home of the Dwelling) and at 466 El Camino Real in Atascadero, is called BIKExperience. It's a challenge to reconsider bikes as more than transportation: They're art. They're for transformation. They're for recreation. They're a way of life. The reason for all this bike madness is Bike Month. With this latest art show, the community of two-wheeled commuters is visibly coalescing, and even growing in numbers--evident by the number of entries in the show and the diversity of art. For one month, the gallery hopes to be a sort of bike Mecca, gathering pixies, recumbents, fixed-gears, and cruisers with baskets to celebrate. The show itself promises to be more diverse than last year's, with more artists hip to the possibilities of "bike art" and a desire by the established artists to one-up their own previous efforts. The theme is deceptively obvious. There are factors limiting participants' creativity, such as the number of activities bikes are used for--basically, just riding--and the fact that bikes are such simple machines. But the artists have managed to milk surprising diversity from the seemingly monochromatic palette by recycling bike parts. 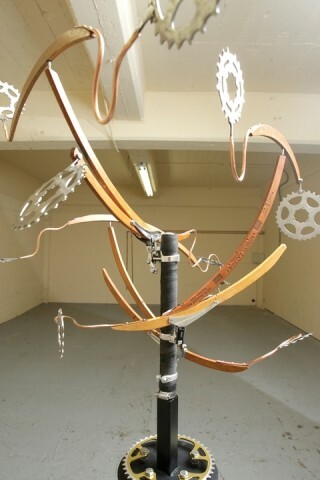 Art made from bikes is de facto bike art. 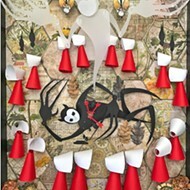 This recycled aspect lends to interactive, hands-on pieces, contraptions that beg to be played with. It also means that not everything makes sense. Pieces look as if they were forged from equal parts Tecate, sweat, and raw enthusiasm, finding form out of the mangled remains of backyard bikes. Some of these creations seem to exist--such as a functionless, multi-colored tower snapped together from Legos--for the sheer enjoyment of their architect. The whirly gigs and wanton apparatuses attest to the fundamentals of bike art: build, create, enjoy. THE FINE ART OF RECYCLING : This mobile is made from old coat hangers and bike gears. # Most of the work is decidedly not fine art. There are vintage posters, rough sculptures, and Frankenbikes. It hardly matters though, because the work is unique and inspired. Several professional artists are participating, adding their layer of authority to the exhibit, but much of the art is from amateurs it's without the pretense, steep prices, and highbrow atmosphere surrounding professional pieces. The works are for sale, with a portion of the proceeds going directly to the SLO County bike coalition. And this year, there's a lot more going on at the gallery than hanging paintings. On May 16, the Tall Bike Posse will host a Bicycle Fashion Show at the bike gallery from 6 to 9 p.m.
What is bike fashion? Think legwarmers over pants, reflective tape, jerseys, courier bags, lots of spandex, little hats, and helmets. And don't forget that bikes themselves can be made into bike fashion. Local bicycle fashionista Sophie Boban is putting this element together for the second year, and is still accepting wearable creations--and models with nice legs to wear them. Contact her at sophie.boban@gmail.com. POSSE UP : Members of the Tall Bike Posse (from left to right) Bill Mulder, Dan Kallal, and Tim Gillham pondered the position of one more wheel on a whirly-gig contraption. # The Tall Bike Posse will also be host to the SLO Bike Kitchen--a low-cost, community bike workshop--for the month of May. The kitchen will be open most gallery hours, and offers help for distressed bikes. 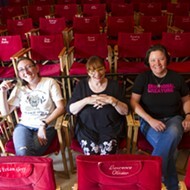 The kitchen is also holding a series of bike maintenance workshops. Check out www.slobikekitchen.org. The SLO BIKExperience art show opens May 2 at 1060 Osos St. (formerly the Dwelling) during Art After Dark, from 6 to 9 p.m. Regular gallery hours will be Tuesday and Thursday nights, Fridays at lunchtime till 7 p.m., and Saturdays and Sundays from 11 a.m. to 7 p.m. Look for more times posted at the gallery. 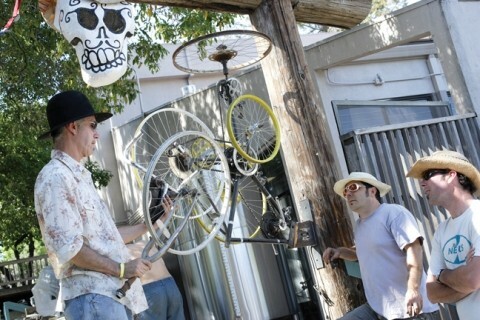 See the Atascadero show May 3 at 6455 El Camino Real (in the old Esteem surf shop) beginning at 7 p.m. For more info about these events, visit tall bike posse.com. For more bike month info, visit www.rideshare.org. Staff Writer Kylie Mendonca always wears a helmet. Tell her about bike safety at kmendonca@newtimesslo.com.